So many artists, so many landscapes and creative approaches to landscapes. Is there anything left to innovate? I’ve been approaching landscape ideas using new ways of manipulating paint media. Grasses and stems created by pouring one liquid into another on the canvas, extrusion, diffusion, and textural ideas can all suggest and indicate landscape elements. At the same time these approaches create an image that isn’t “put together” quite the same way as a typical landscape painting – even a contemporary style painting. As an example, there’s a close up of a small section of “Rhapsody on the Sea” below. 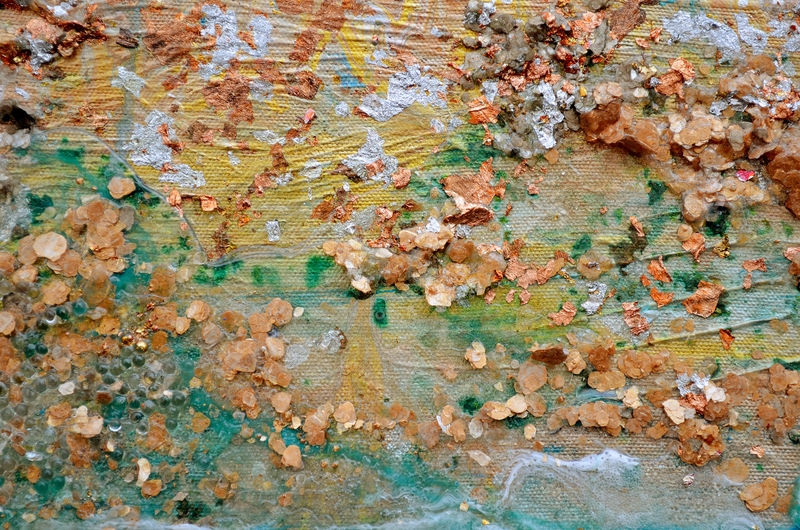 In the photos of the whole piece, there are areas that resemble sea foam, with more light colors and transparency. Some of the lightness and foamy texture is created using different sized tiny glass spheres to “represent” bubbles. Flaked mica forms stacks and waves, simulating sand and rock. In another close-up, also from “Rhapsody on the Sea” there are examples of how the transparency of acrylic media is used. Acrylic fluidity and transparency do much of the work of creating the illusions in many of my reinvented landscapes. Flow patterns replace brushstrokes. 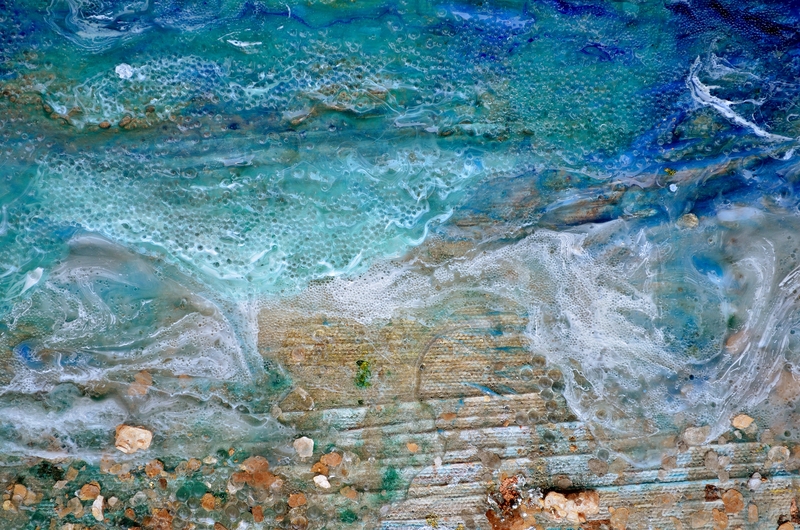 Small scale fluid textures and layers of transparent media simulate the features of landscape and seascape rather than simply representing them. The illusion is still there, but it has a different character from the painted illusions of a more traditional landscape painting. In the close-up below, also from Rhapsody on the Sea, reflective metal foil applied in patches to the gessoed lowest layer creates subtle lightness and reflectivity in the paint film on top of it. 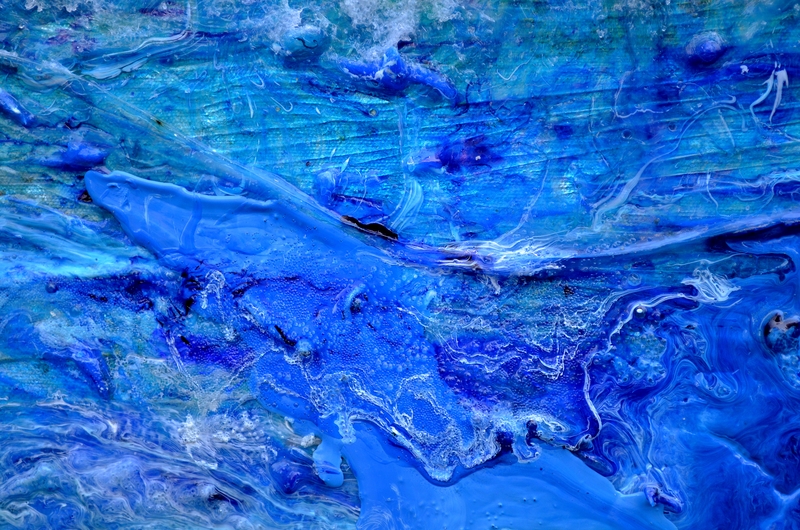 Swirls of color connect in 3-D inside the thick transparent film, creating agate like effects close up. 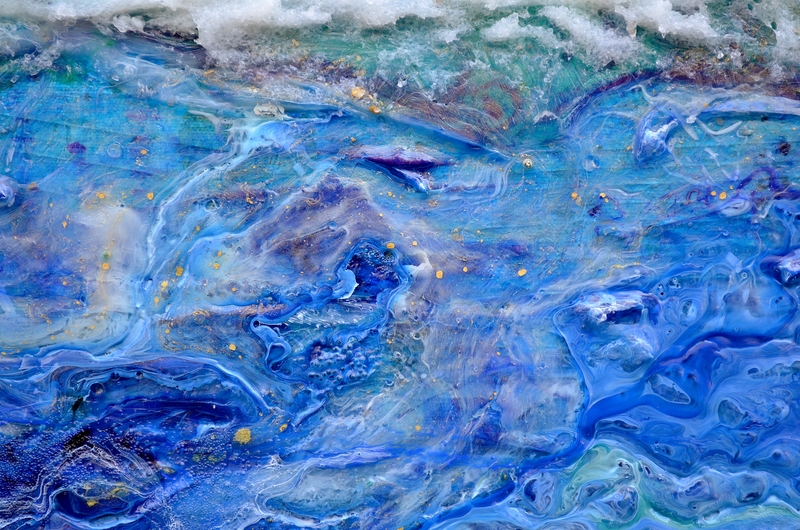 From father away, the “agate” texture becomes the features of an abstracted seascape idea. The clarity and good drying properties of acrylic films and media allow complex 3-D patterns of color within the film, like glass art or marbles. The range of media available all have different properties when dry as well as when wet. As wet media they are liquids, gels and pastes with varying viscoelasticity, and they dissolve and spread into one another to different degrees. The media also have different densities (some tend to sink or float when layered as liquids) and differing amounts of shrinkage on drying. The shrinkage properties of different media are used in the reinvented landscapes to create undulating surface textures, that simulate landscape features or that create patterns or reflected light that simulate light in the landscape. 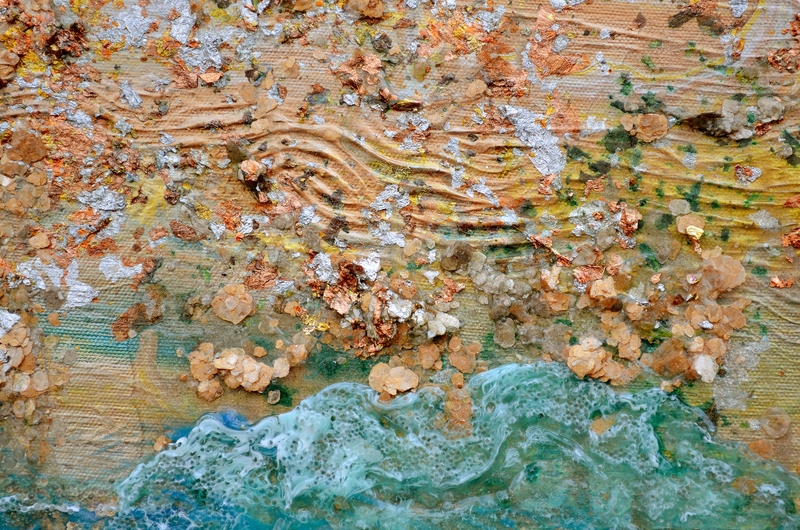 An example of an undulating texture (enhanced with extruded acrylic) is shown below, in a close-up image taken from “Pensive Waters”.